Continue Reading"How to Splunk Lenel OnGuard Badge Events"
I think it’s safe to say at this point everyone and their dog’s dog has heard in some form or another about the Mandiant report released entitled “APT1: Exposing One of China’s Cyber Espionage Units”. Regardless of what you think of the report – Jeffrey Carr has a good rebuttal – the one thing it does give us is a LARGE amount of indicators which can be made into actionable intelligence and I HIGHLY commend Mandiant on sharing this intelligence! Continue Reading"Making Mandiant APT1 Intel Actionable Using Splunk"
Continuing on with my goal for 2013 of writing more blog posts I figured I’d go back and look at a neat use I found for Splunk and two kinds of data I was able to ingest in to it. As Splunk has grown in popularity over the last year I started see more and more blog posts, twitter comments, etc regarding various uses for Splunk and most of the time I look over at my own dashboards and see items I’ve had in place for a long time being described. 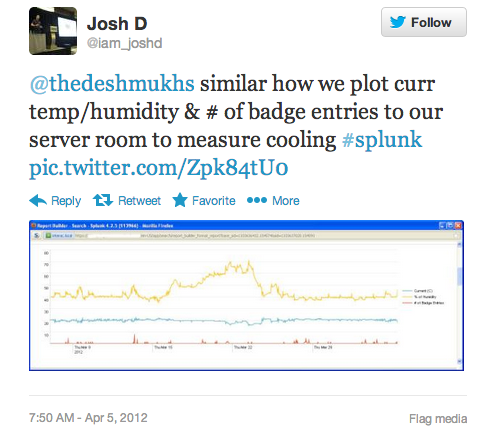 Continue Reading"Server Room Temp’s and the Human Effect: Basic Reporting with Splunk"
Continue Reading"Using Splunk to Catch Pesky Employees Outsourcing Their Job"
Continue Reading"Slidedeck From My Most Recent Splunk Event Presentation"
As I talk to different Splunk users, watch twitter, read blog entries and have the great opportunity to speak and participate in Splunk events I always find it so interesting the various use cases people have for Splunk. True that most organizations have brought it in primarily for Security tasks but time and time again it’s so easy to find other great uses for it. Through these discussions I’ve been able to find many new uses for Splunk, ones which I had not initially thought of or was unsure of how to approach. From this I thought it would be great to have a central point of reference to break down these use cases into the reports/searches built for them so people could gain from others successes. Continue Reading"Monday Fun: Splunk Use Cases"
1. You have enabled syslog logging on your Web Filter appliance. Continue Reading"Barracuda Web Filter App for Splunk"
Continue Reading"RSA SecurID Appliance application for Splunk"
Finally I’m making this Splunk app freely available to the general public (see attachments to this post). I built this app almost a year ago and it is definitely not near perfection. I built it over a couple of days on spare time to work within our environment where we only have a few USPVM’s. So I can’t speak for how well it scales or how well the searches work over very large data sets. Frankly it works for me and I haven’t had enough spare time to invest into further development or optimization of it. This is why I am launching it here first and not on Splunkbase, sadly in my mind it’s nowhere near ready to be on Splunkbase. Continue Reading"HDS USP Analytics App for Splunk"